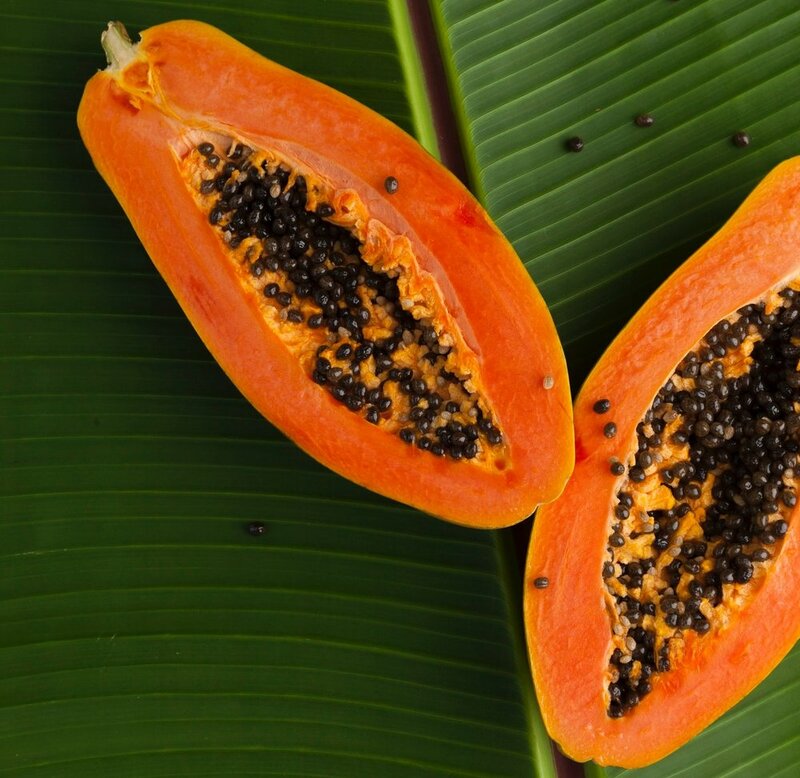 Papaya helps improve digestion, alleviate constipation, reduce harmful and unproductive bacteria in the gut, and help calm inflammation. Aloe is not only amazing for healing the skin, but it is also a miracle for healing the gut. Aloe heals inflammation in the gut, helps to heal ulcers, and kills harmful bacteria like H.pylori and E.coli. Also, the extra fiber in this smoothie helps to sweep debris and toxins out of the colon. And I could also rename this smoothie, Skin Healing Smoothie, since both papaya and aloe are both amazing for healing skin complaints like eczema and psoriasis. For this smoothie, I like to use the larger variety Maradol papayas, but you can use any variety from Mexico, the Carribean, or Central America. It’s fine if it’s not organic. The benefits outweigh the problems with pesticides. I recommend avoiding Hawaiian papayas due to GMO contamination issues. Papayas are ripe when they are mostly yellow and give with pressure. I have found that I have to let my papayas ripen until they look like they are just about to go bad. The peel may look awful, but you will have a wonderfully ripe and delicious papaya underneath. Cut the ripe papaya in half lengthwise, and scoop out the seeds. If you like spice, you can add a couple of seeds to the smoothie, which are rich in digestive enzymes. I also like to use fresh aloe gel from whole aloe vera leaves. These are available in some grocery stores like Whole Foods or in Asian food markets. You can also buy them online in bulk at aloeking.com. Cut a 2-3 inch section from the leaf, cut off the skin on one side, and scoop out the gel with a spoon. You can wrap the cut end of the leaf in plastic wrap or parchment paper and store in the refrigerator for up to 5 days. I prefer to use fresh banana, mango, and pineapple in this smoothie, which taste the best and has the most nutrients. However, you can use frozen when fresh is not available. Blend all the ingredients in a high speed blender until smooth, adding more coconut water or filtered water as needed until desired consistency is reached. Makes approximately 24 ounces. Enjoy!